University of Bristol scientists researching how drones can be used to speed up landmine clearance will fly a drone over Old Trafford today [Monday 4 April] – UN International Day for Mine Awareness – to demonstrate how large, football pitch-sized areas can be mapped quickly. The research, led by Dr John Day of the Interface Analysis Centre in Bristol's School of Physics, is funded by Find A Better Way, the charity founded by England and Manchester United legend Sir Bobby Charlton. Find A Better Way is currently funding nine different university programmes in the UK and Croatia researching faster, cheaper, and safer methods of landmine detection. There are an estimated 110 million active landmines in the world today, most of which are located in less developed countries. Clearing these mines using current technologies would cost an estimated $30 billion and take over 1,000 years. The Bristol researchers plan to speed up mine detection by flying drones over potential minefields. The drones will obtain high-resolution images that show the terrain and objects visible on the surface clearly. John Fardoulis, project researcher in the Interface Analysis Centre, said: "Flying over the Manchester United pitch will demonstrate that we can map a football pitch-sized area of land in two hours or less. Clearing a minefield that size can currently take months, and the maps our drones will generate should help deminers focus on the places where mines are most likely to be found. This will speed the process up and make the demining significantly safer." The team also hope to develop hyperspectral imaging techniques, which will allow them to obtain a separate image of an area at many different wavelengths or colours of light. These images could detect the effects explosive chemicals have on vegetation as a means of identifying mined areas. Dr Day explained: "Living plants have a very distinctive reflection in the near infrared spectrum, just beyond human vision, which makes it possible to tell how healthy they are. Chemicals in landmines leak out and are often absorbed by plants, causing abnormalities. Looking for these changes might be a way of discovering the whereabouts of mines. "Infrared light can also assist detecting man-made objects on the surface of mine fields, as they do not produce this infrared reflection. Unexploded ordinances or camouflaged mines on a green field can be difficult to see in normal light, but infrared light can make them stand out from surrounding foliage. Drones taking infrared pictures to map suspected danger zones may provide a quick and safe way to tell if an area is likely to be hazardous." 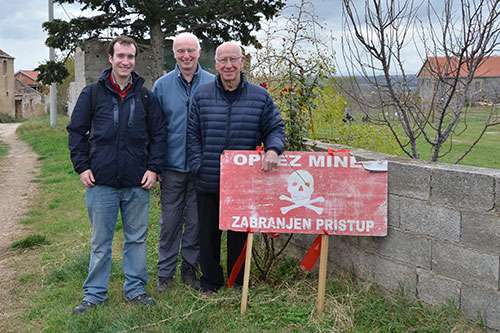 The Bristol team, which includes Dr Tom Scott, Dr Oliver Payton and Professor Jim Freer, are developing this technique with commercially available drones, affordable for use in less developed parts of the world where landmines cause the greatest humanitarian problems. The project began in January 2016 and will last for two years.